Global seaborne dry bulk trade has been performing more vigorously. In the past twelve months a fairly robust revival unfolded, building on a slight pick up in the previous year from earlier stagnation. There are signs that in 2018 further expansion is likely, although doubts have arisen about whether it will match the recent growth. After the sharp deceleration to no growth in 2015 and only a minimal increase in 2016, there was great anxiety about prospects. Some of the major import growth drivers of the past seemed to be fading. But the solid recovery seen during 2017 has again demonstrated, or can be interpreted as implying, that there is still potential for an upwards trend to continue. Following four annual advances in a 5–6% range during the 2011 to 2014 period, the abrupt loss of dry bulk trade momentum to a nil annual increase and then a marginal 1% rise, was a severe shock. Declining coal volumes contributed to this weakness. Last year, coal trade returned to brisk growth and other bulk commodity trades mostly saw healthy enlargement, resulting in an estimated 3–4% increase. Another strong increase in China’s imports was a prominent influence in 2017. Higher purchases of iron ore and coal by Chinese buyers were especially visible, while other commodity imports such as soyabeans also grew. Elsewhere, in countries around the world, the improvement in global economic activity was positive for many commodity importing industries. Although it is a rather general influence, the progress of global economic activity has effects, sometimes quite noticeable, on numerous dry bulk commodity move- ments. Changes in business and consumer spending patterns and also government spending can cause sizeable variations in output levels in industries using bulk commodities. Up to last year, there were several under-performing years in major economies, exacerbated by China’s slowing trend. During 2017 a firmly improving broad trend emerged, with accelerating economic growth rates in most of the main countries. Estimates published recently by the OECD organization, showing growth in gross domestic product (GDP), a widely used overall measure of goods and services output, are summarized in table 1. These economic activity calculations put the OECD area’s GDP growth rate in 2017 at 2.4%, a marked improvement from 2% or less in preceding years. The OECD area comprises mostly the USA, Europe, Japan and South Korea. China is estimated to have seen a small acceleration to 6.8% growth. What is the outlook for these economies in 2018? A fairly similar outcome is expected, resulting in a 2.4% average growth rate for the OECD area as a whole, accompanied by a slight slowing in China to 6.6%. Economists at the OECD point out that “the world economy has strengthened, with monetary and fiscal stimulus underpinning a broad-based and synchronized improvement in growth rates across most countries”. This statement is a remarkable contrast with perceived prospects a year ago. At that time, global economic activity was characterized as remaining stuck in a “low growth trap” with no obvious means of escape unless economic policies could provide more support. The better-than-expected performance last year, predicted to persist over the next twelve months, was greatly assisted by strengthening in Europe and Japan, as well as the USA. China’s economy regained momentum and did not continuing slowing, although that trend is expected to resume this year, albeit moderately. But some of the essential supports for world economic activity are still considered vulnerable, especially business investment spending which remains lacklustre. A large proportion of global dry bulk trade movements is associated with the steel industry. Demand for steel, and production volumes reflect patterns of spending in various countries dependent on how economic activity is progressing. Changes in steel production, in turn, affect consump- tion and imports of iron ore, coking coal and some other raw materials. During 2017 steel production trends strengthened in many countries. Based on figures for the first eleven months, compared with the same period a year earlier, the dominant producer China increased crude steel output by 6%. In the European Union there was a 4% increase, and in South Korea a 3% rise. Japan was the laggard, achieving only an unchanged volume. These results represented a substantial improvement in the trend (except for Japan), after reductions in the previous year or, for China, only a marginal increase. Steel output in many countries last year was assisted by much lower Chinese steel products exports (coil, strip, plate etc) which allowed more of the destination countries’ demand to be produced by domestic steel mills. Growth in demand for steel could continue through 2018, based on the latest World Steel Association short-range outlook published recently. However, percentage rates of growth for finished steel products demand this year are expected to slacken in the EU and Japan while, in China, a sharper slowing to nil expansion is foreseen. Actual steel production volumes are not always exactly in line with demand calculations. About one-third of all global seaborne dry bulk trade is comprised of iron ore and coking coal movements. In 2017 iron ore trade appears to have increased by 4–5%, reaching over 1,450mt (million tonnes), as shown in table 2. Coking coal trade (not shown separately) apparently increased similarly to over 250mt. Over the twelve months ahead rising trends may continue. Growth prospects are particularly focused on China’s iron ore imports, which may reflect an intensified emphasis on higher quality ore from foreign sources, displacing more lower quality material from domestic mines. After the vast expansion seen in the past decade, imports into China comprise more than 70% of global seaborne iron ore trade. In 2016 the total exceeded 1 billion tonnes for the first time, reaching 1,025mt (including some land movements). Last year’s total is estimated to have risen by a further 5–6%. Expanding steel production has been a key influence, together with a rising proportion of foreign ore. In the past twelve months, stockbuilding at ports also boosted imports. about one-sixth, but is more widely dispersed. Imports into Japan and India are the largest elements. The 2017 world total may have increased by 3–4%, accompanying higher steel production volumes in a number of raw materials importing countries. Among potential extra coking coal movements this year, attention is focused on India’s imports. Steel production is still rising rapidly with expectations of sustained growth. Although India has large coal resources, coking coal available from domestic mines is generally inferior quality, ensuring greater dependence on external supplies. Trade in the steam (or thermal) coal category comprises almost four-fifths of overall global seaborne coal movements. Power stations are the chief importers in many countries, together with cement producers and other industrial users. Preceding an upturn last year, a downwards trend in world steam coal trade volumes was seen after the peak reached in 2014. This weakness was widely expected to persist, but imports into a number of countries strengthened in 2017, when the annual world volume apparently rose by at least 2–3% and possibly by as much as 4%, based on provisional calculations, perhaps reaching 910mt or more. Nevertheless, the prevailing tone surrounding coal consumption is predom- inantly negative. Intense environmental pressure to cease, or at least heavily reduce, coal burning has already affected import demand around the world. Switching energy sources towards cleaner fuels or renewable energy is well under way in many coal importing countries, especially in Europe and also in China. This pattern of suppressing coal usage is not universal, however. In some countries, especially in Asia, using coal has compelling economic advantages. Electricity demand in these countries is likely to expand strongly over the years ahead. Extra coal- fired power stations are planned or under construction, leading to rising imports. Large volumes of grain and soya are moved annually in international trade, as well as other oilseeds and meals. Estimates of trade on a calendar year basis are shown in table 2, which shows that annual totals for the main grains (wheat and coarse grains) plus soyabeans are approaching the symbolic 500mt level. But trade statistics are usually compiled, and comparisons made, on a ‘split year’ basis, known variously as a ‘crop’, ‘marketing’ or ‘trade’ year, which reflects the pattern of world harvests. Another feature is the profound impact of weather changes, often unpredicted, on output from domestic crops in importing countries, sometimes resulting in disproportionately large changes in import demand. Harvests in exporting countries are also affected by weather, adding to instability in global trade patterns. According to calculations by the Inter- national Grains Council, global trade in the grain segment comprising wheat plus corn and other coarse grains increased by 2% in the past 2016/17 crop year ending June, reaching 353mt. Additional import volumes were widely spread. Previously there was strong expansion over several years. During the current 2017/18 crop year a similar 2% growth rate is expected. At present there are no signs of severe harvest shortfalls in importing countries which could have a big positive impact. Consumption trends generally are providing solid support. Within the soya sub-sector trade is still evolving robustly. Using a marketing year ending September, global trade in soyabeans and meal grew by 5% in 2016/17 based on US Department of Agriculture calculations, reaching 205mt. Another similar 4% increase is forecast in 2017/18. China’s rising import demand trend, as well as extra volumes elsewhere, has been a major contributor to world soya trade strength. In 2016/17 imports into China, which are almost entirely in the form of beans, totalled 94mt. Although domestic soyabean output has increased in the past two harvests, consumption is expanding faster and so higher foreign purchases result. A further rise this year is predicted. Although many elements are individually relatively small, the minor bulks sector is extensive. It includes trade in numerous commodities, some of which are not minor but very voluminous. Overall quantities in the category are huge, amounting to over one-third of all world seaborne dry bulk commodity trade. 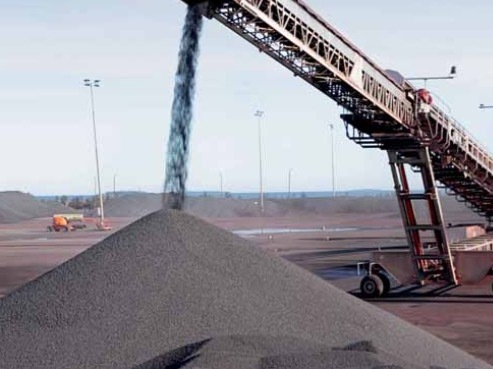 The diverse range of commodities comprises cargoes related to manufac- turing and construction activities, which are the largest part of the group. Agricultural or related cargo movements comprise the remainder. In the entire category, tentative estimates suggest that global seaborne trade may have grown by about 2% last year, raising the overall volume to a total approaching 1,900mt. Further growth may be seen in 2018. Steel products and forest products are the largest individual commodity movements. Other prominent industrial components are bauxite/alumina, iron and steel scrap, cement, petroleum coke, nickel and other ores. These are accompanied by agricultural bulks such as sugar, oilseed meals and rice, plus various raw and processed fertilizers. Among importers, China is prominent, with an apparent total of almost 260mt in 2016, of which more than half consisted of bauxite/alumina, and nickel and other ores. Some growth signs emerged last year. The remainder of world trade in minor bulk cargoes is widely dispersed. Confidence in predicting further expansion of global seaborne dry bulk trade revived last year. Despite some negative elements, the broad picture seemed to indicate that there is still potential for additional import volumes of numerous commodities in many countries around the world, at least in the twelve months immediately ahead. But signs of a return to earlier higher growth rates are currently absent. Partly this view is linked to expectations for world economic activity. The recovery in economic growth among the advanced countries OECD group seen over the past year has strengthened from a highly tentative improvement, to a more robust trend. While doubts about whether recent momentum can be sustained remain valid, greater albeit moderate optimism seems justifiable. Moreover, while there is still a risk of a sharp slowdown in China’s economy, the past twelve months has demonstrated that there is much underlying support for growth. Forecasters presently foresee only modest slackening over the year ahead. This expectation is especially significant, given the size of China’s contribution to world bulk commodity import demand enlargement. Other, more specific influences are also bolstering these imports. At present, arguably the most visible negative influence likely to affect global seaborne dry bulk trade is the environmental pressures affecting coal trade. These suggest that in the longer term coal trade will cease growing and may begin a downwards trend. However, growth among other commodities may be sufficient to keep the overall dry bulk trade total on an upwards path.